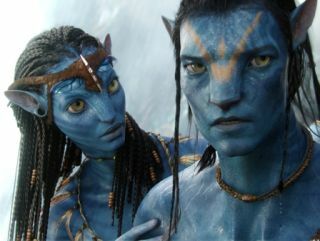 "Don't worry dear, we don't have to buy the rubbish version in April - we'll wait for the November release"
James Cameron has revealed that Avatar won't be getting a 3D Blu-ray release until November, confirming that the film will not be among the first movies released on the 3D home format. Speaking to the Wall Street Journal, Cameron announced that Avatar will get a special edition DVD and Blu-ray 3D release in the winter, but a standard non-3D version will hit shops – in the US at least – 22 April. It's a touch annoying that Fox has decided to do the dreadful double-dip on the film. This used to happen to DVDs every few years – special edition, extended edition, definitive edition, milking-the-cash-cow edition – but now it seems that distributors are happy to bring out various versions of a movie in the same year. The last major release to get this sort of treatment was Watchmen. A November release for the 3D version means that a number of 3D Blu-rays will be on the shelves first – including Monsters Vs Aliens and Cloudy, With A Chance Of Meatballs. Panasonic, who helped Cameron with the equipment to film Avatar, recently showed off its Panasonic Viera TX-P50VT20 3D TV, which will be one of the first to hit the UK.